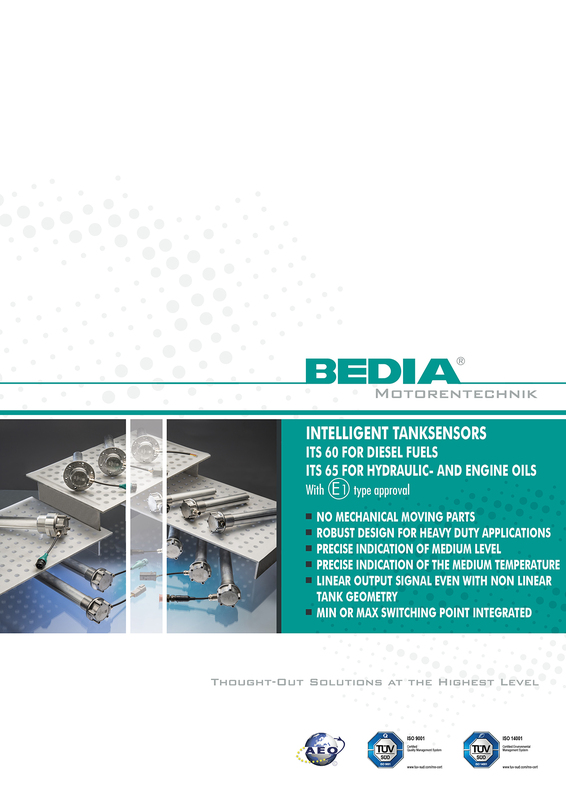 BEDIA intelligent tank sensor ITS 60 is used to monitor the filling levels of Diesel fuels. The sensor is able to automatically recognize what kind of Diesel fuel (Bio-Diesel, Summer-/Winter-Diesel etc.) is present and calibrates itself to it. The capacitative measurement principle permits measurement of levels without mechanically moving parts. This considerably increases stability and operating safety. The new tank sensor ITS 60 is characterized by a particularly stable, but light mechanical system specially designed for “Heavy Duty Applications”. The mounting flange and measurement tube are constructed from die cast aluminium. This construction permits the insertion of tank sensors up to 1200 mm in length, without additional support on the tank floor. The flange hole distribution is compatible with commercially used tank sensors. This means that this system can be used without expensive conversions. The ITS 60 level measuring system is based on a capacitative measurement principle. A capacitor is formed by an electrically conducting plate and an aluminium tube. Depending on the level, the remaining air volume between the measurement electrodes varies. The resulting capacitative change is recorded and processed by the microcontroller. A problem in capacitative level measurements is the varying permittivity of the various fuels. In general capacitative sensors just a single fuel type can be correctly measured. This can lead to a measurement inaccuracy of up to 50 % if the fuel is changed (winter or summer diesel, use of bio-diesels or mixed operation). The ITS 60 is equipped with a BEDIA patented sensor structure that makes it possible, regardless of the fuel used, to measure the correct fuel level. The conductivity of the medium, which dependent on the presence of water in the fuel tank, is compensated for over a wider range using various plausibility checks by the microcontroller. The measurement range, which can be programmed according to customer requirements, lies between 20 mm below the seal edge and 10 mm from the sensor end. The use of a microcontroller not only permits linear tank geometries to be taken into account using the ITS 60 tank sensor, but also many different tank geometries to be correctly evaluated by programming up to 15 reference points. The output signal therefore corresponds to the actual volume and gives precise information about the tank contents. Another equipment characteristic of the ITS 60 is the integrated switch output. This output can be set up individually as a minimum or maximum function. In addition, the switch point position, dalay time and switch hysteresis can be programmed. A typical application case for the switch output is the overflow cutout on an automatic tanking unit. With the integrated switch output, an additional sensor and therefore also the cabling expense and mechanical process connection can be omitted. The analogue output is based on an “open-drain voltage output”, which emulates a voltage drop on a resistor. So the sensor can be directly used instead of a normal resistance sensor. The switch output is available as a lowside switch or a highside switch. The switch output is short-circuit protected and suitable for 500 mA. With inductive loads, a freewheeling diode must be switched in parallel to the consumer.